There are few schools in Metro Vancouver with such a sublime view as Burnaby’s Capitol Hill Elementary, where to the east and north lies an unobstructed panorama of mountains. Its quaint, 100-year-old wing with its false bell-tower on the roof (all now seismically upgraded) is on display to traffic passing along East Hastings Street, while its modern north wing can be seen from Holdom Ave.
One school formed of two different structures joined together. That’s much the way it is in the surrounding community. Well-off families living in tidy, million-dollar homes to the east, not-so-well-off families living in social housing or apartments to the west. And like many schools in Metro Vancouver that have pockets of poverty in their catchment areas, that support starts early in the morning with a breakfast for children arriving at school having had little or nothing to eat. All such breakfast programs in the Metro region are paid for by private donors. Capitol Hill receives money from Vancouver’s Tzu Chi Foundation, the Burnaby Firefighters, and the Capitol Hill Community Hall, amounting to about $2,500. Last year, it also received $2,000 from a donor who is unable to make a contribution this year. So Vancouver’s Assante Capital Management have stepped in, donating $2,000 to the school through The Vancouver Sun’s Adopt-A-School campaign. “We are thrilled to be able to help and make a difference in children’s lives,” said Debra Tarigan, a senior administrative and marketing associate with Assante. 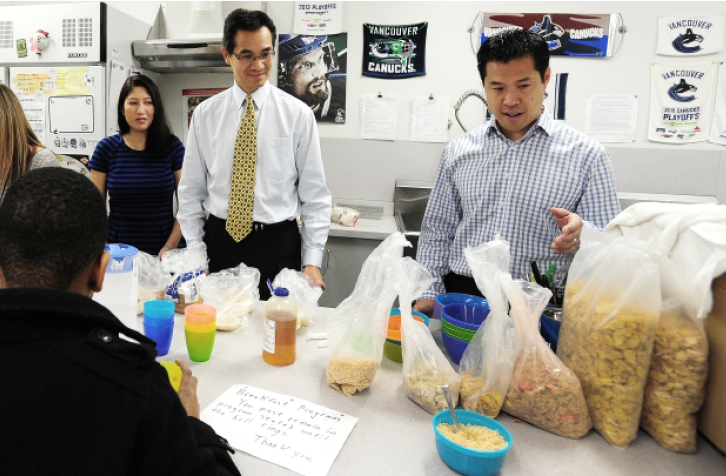 Tarigan and her supervisor, David Woo, visited Capitol Hill before the school closed for the Christmas holidays to meet Chow and see the breakfast program in operation. The lack of a stove in the kitchen means staff who help out can only serve a cold breakfast. “They get toast, cereal, fruit, yogurt, bagels. If we had a stove, we could give them eggs in the morning or make pancakes. I’m sure they would like that for a change,” said Chow. The kitchen has a place for a stove and a hookup, but Chow needs $1,500 to buy one and the utensils to go with it. There is no money in the budget, and with education cutbacks it is unlikely there will ever be. “It’s something we had hoped to get,” he said. He said families struggling with poverty seldom ask for help. “They are too proud. It usually comes out when we ask families for money to pay for field trips. It’s not a lot of money, but some parents admit they can’t afford it. When that happens, we take care of it. We never allow a child to miss an experience because of lack of money,” said Chow.